When the River Forest Tennis Club caught fire and burned in 1905, Wright was tapped to redesign their building. Although their have been many additions, including a move in 1920, The original design was a precursor to the Banff Pavilion. Much can be gained by studying the plans of the River Forest Tennis Club. "Wright referred to the (Banff) pavilion as a more substantial version of the River Forest Tennis Club" (LWp116). The Tennis Club was 204 feet long, the Pavilion was 200. One end included a Ladies Locker Room and a Kitchen. The other end a Men's Locker Room. The three Fireplaces included built-in seating. Doors opened outward from the expansive interior, in essence, removing the wall which lead to an open Terrace which ran more than half the length of the building. Wright designed each end by rotating a square 90 degrees. 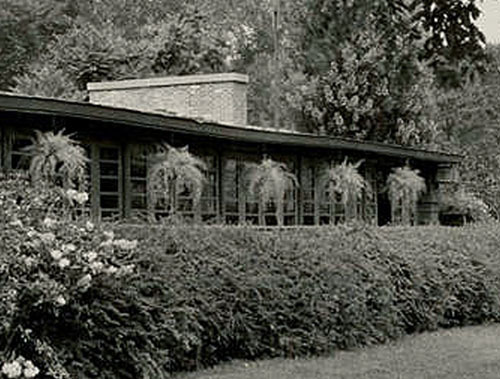 One distinctive design element Wright used in the Tennis Club and repeated in the Pavilion may have been unique to these two buildings. On either side of the Men's and Women's Locker rooms was a elongated row of Balustrated windows, or as Wright specified in the Tennis Club, 4"x4" Vertical Spindles with glass between. This allowed natural light in, while providing a measure of privacy. This design was repeated on behind the built-in seating of the two end fireplaces. This enclosed the area near the fireplaces and added a measurer of intimacy, much like his tall back chairs surrounding some of his dining room tables. It was also on either side of the center fireplace, and ran from entry to entry. 1: River Forest Tennis Club. Wright's original rendering for the "Ausgeführte Bauten und Entwürfe von Frank Lloyd Wright", Published by Ernst Wasmuth A.-G., Berlin, 1910. Plate XLII. 2: Banff National Park Pavilion. 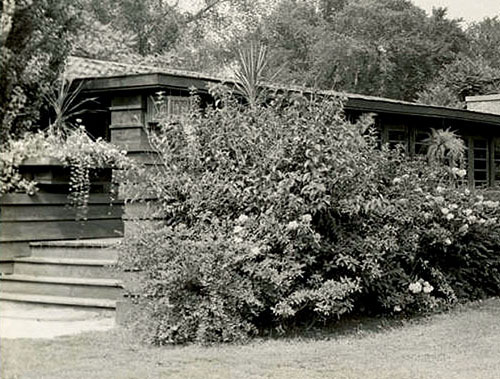 Wright's original rendering indicates stucco siding rather than "board and batten" which was added to the original plans and used in construction. Stucco was used in the construction of the Lake Geneva Hotel (see below) (S.171), also designed in 1911. Courtesy of Frank Lloyd Wright Foundation and Horizon Press. 3: Wright Membership Card 1907. This may be one of the earliest photographs of the Tennis Club. Wright designed the Logo seen on either side of the photograph. (Membership Card possibly designed by Wright, but not confirmed.) Courtesy of Wisconsin Historical Society. 3b: Wright Membership Card 1907. Detail. This may be one of the earliest photographs of the Tennis Club. 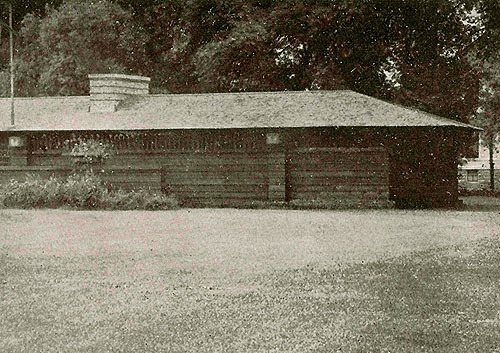 4: River Forest Tennis Club circa 1910. Photographed by H. Fuermann & Co. Published in "Frank Lloyd Wright, Ausgeführte Bauten" 1911, page 97, by Ernst Wasmuth A.-G., Berlin. 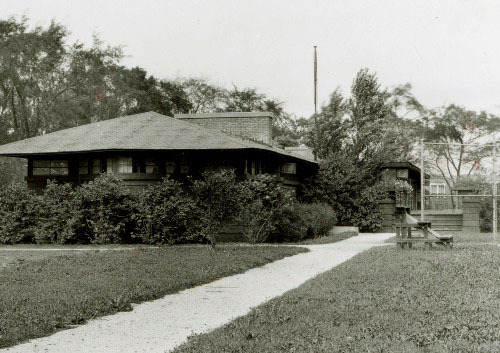 4b: River Forest Tennis Club circa 1910. Detail, left side. 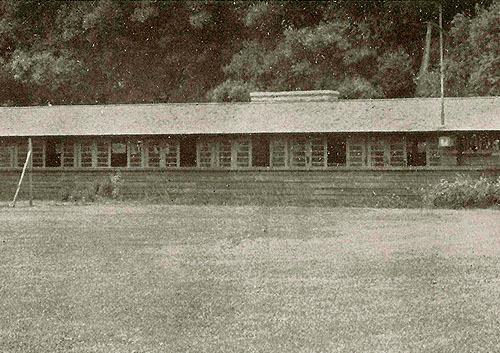 4c: River Forest Tennis Club circa 1910. Detail, center. 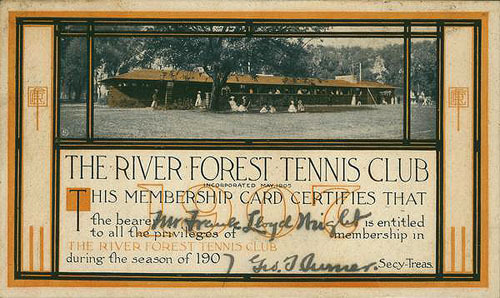 4d: River Forest Tennis Club circa 1910. Detail, right side. 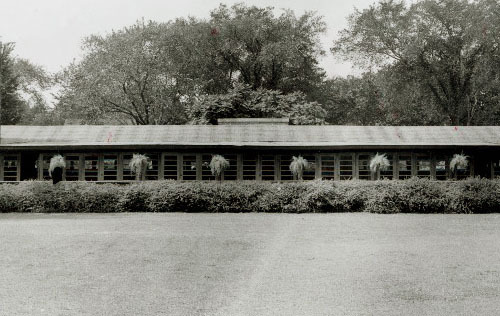 5: River Forest Tennis Club circa 1940. Photographed by Gilman Lane. 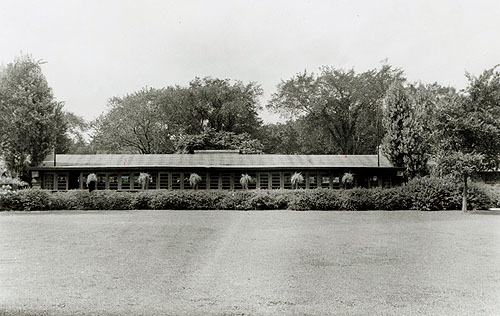 5b: River Forest Tennis Club circa 1940. Detail. Photographed by Gilman Lane. 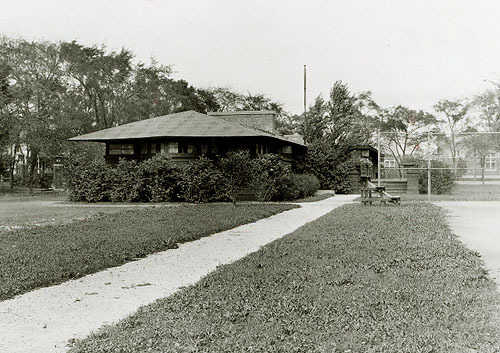 6: River Forest Tennis Club circa 1940. Photographed by Gilman Lane. 6b: River Forest Tennis Club circa 1940. Detail. Photographed by Gilman Lane. 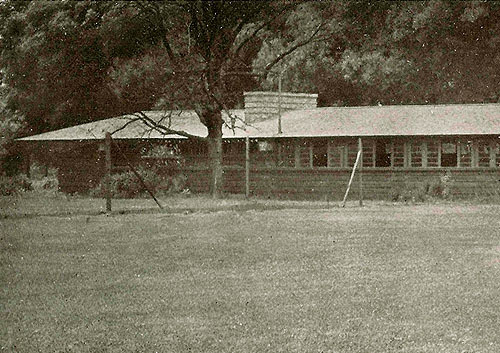 6c: River Forest Tennis Club circa 1940. Detail. Photographed by Gilman Lane. 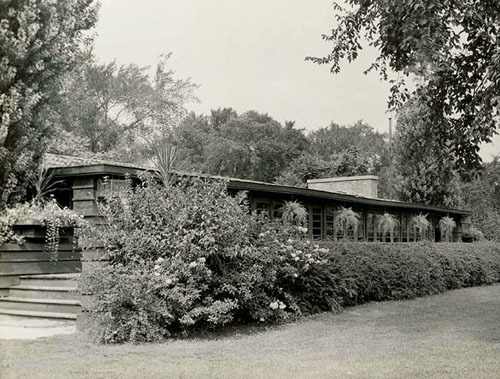 7: River Forest Tennis Club circa 1940. Photographed by Gilman Lane. 7b: River Forest Tennis Club circa 1940. Detail Photographed by Gilman Lane.